Griffith (in sunglasses) and CCC corpsmembers performing at Golden Gate National Recreation Area in 2014. Hey, Michelle Obama, have any plans for May 20 and 21? That's when three members of our local Fortuna California Conservation Corps will be in Washington, D.C. to help celebrate the National Parks Service centennial with a nature-inspired dance. And, yeah, they want you to join in. The BioBlitz Dance came about as part of a collaboration between National Geographic and the National Parks Service. Every year for the last decade, they've encouraged people to get out to their national parks for a BioBlitz event, in which people have a short amount of time to find, count and record as many different species as possible. The purpose is to bring awareness to the importance of biodiversity. The program has a lot of educational material online, which you can find here. Redwood National Park's BioBlitz will be on May 26, with information here. The park will also be hosting a centennial celebration on June 26, information is in the press release below. So, why a BioBlitz Dance? And why is this a big deal? Well, John Griffith, a conservationist with the California Conservation Corps, is kind of a dance sensation. Some of you may remember his video gone viral from a few years ago, occasionally mistitled "Park Ranger Dancing", in which he busts some serious moves to the delight of the young people he supervises. The video garnered more than 6 million views on YouTube, and Griffith channeled his newfound Internet fame into doing what he loves most: educating the next generation about the environment. "I’m a conservationist and I’ve always tried to get people interested in wildlife conservation," Griffith said. "I want to get people outdoors. A lot of the talk about biodiversity is depressing, like animals going extinct and stuff. The BioBlitz Dance is a celebration of nature. People have been dancing to celebrate the outdoors for centuries.Traditionally there were songs and dances, we don’t have that anymore." Carol Seitz, BioBlitz Project Manager, said the BioBlitz dance has been one of the "many highlights" in the 10-old-year program. "We are so excited to have John and his crew be an official part of the National Parks BioBlitz and help us kick off this national celebration of the park service and biodiversity in our parks," Seitz told the Journal in an email. "While not everyone can join us in Washington, D.C. this month, everyone can dance the BioBlitz dance." For those interested in making their own video or calling on FLOTUS to join in, Griffith and his crew have uploaded a video, which you can find below. Don't worry if you don't get the moves just right — the only hard and fast rule is that the BioBlitz dance must be performed outdoors. And, yeah, we've got plenty of that. Orick, CA – The National Park Service kicks off a second century of protecting America’s greatest places and stories with events around the country celebrating the agency’s 100 years of engaging communities through recreation, education, conservation, and preservation. On Sunday, June 26th, Redwood National and State Parks will celebrate the National Park Service Centennial with a festive day of food, music, interactive exhibits, and activities for all ages. “This event is an opportunity for visitors to discover and celebrate the many ways the park is restoring our unique coastal redwood forest for current and future generations to enjoy.” said Steve Prokop, Park Superintendent. The event will take place on the site of a former lumber mill at the junction of Highway 101 and Bald Hills Road just north of Orick, CA from 12:00 - 5:00 pm. The mill site was purchased by the Save the Redwoods League in 2013. Plans for the eventual development of visitor facilities and the restoration of natural landscape on the mill site are already underway. •	Live music by the Trinity Alps Chamber Music Festival and a local favorite, The Good Homosapiens. •	Comments from US Congressman Jared Huffman, Save the Redwoods League President and Chief Executive Officer Sam Hodder, Yurok Tribal Chairman Thomas O’Rourke, and Redwood National and State Parks Superintendent Stephen Prokop. •	The unveiling of a commemorative plaque honoring Stephen T. Mather, first director of the National Park Service and a founder of the Save the Redwoods League. •	A visitor-created “Pop-Up Museum” where everyone is invited to bring a photograph, artifact or memory of the redwoods or their favorite National and State Parks to share with others. •	Pony rides by the Redwood Creek Buckarettes. •	Shuttle service between the Centennial Celebration site and the Lady Bird Johnson Grove throughout the event will be available thanks to support from the Yurok Transit Authority. Visitors are encouraged to hike the 1-1/4 mile loop trail or take the 5-mile hike back to the Centennial Celebration on the Berry Glen Trail. •	Junior Ranger activities for kids of all ages (but targeted for the 7-12 year old age group) with a group Junior Ranger swearing-in at 4:00. •	Ranger-led interpretive walks to the Centennial Tree, a massive old-growth redwood tree with complex canopy structure close enough to the ground for all to see. •	Bicycle rentals offered by Redwood Adventures to explore future bike trails connecting the site to Elk Meadow, Prairie Creek, and Lost Man Creek bicycle trails. •	Interactive exhibits on park restoration efforts, Yurok traditional crafts, and California condors. •	A photographic exhibit by Dave Van de Mark, an early advocate for the creation of Redwood National Park. 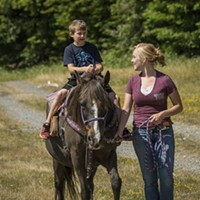 •	Shuttle service for those with physical disabilities will be available through the Yurok Transit Authority between the Centennial Celebration site and the towns of Klamath and Crescent City on the day of the event. Check our web page (nps.gov/redw) for details on this service. We wish to thank our partners who are helping us with the Centennial Celebration, including: Save the Redwoods League, Redwood Parks Conservancy, the Yurok Tribe, Orick Chamber of Commerce, and the Humboldt Lodging Alliance. Many other supporters and exhibitors will be on hand during the day as well. Since 1916, the National Park Service has been entrusted to preserve unimpaired the natural and cultural resources and values of the National Park System for the enjoyment, education, and inspiration of this and future generations. Redwood National Park was dedicated in 1968 and attracts visitors from all over the world who marvel at the ancient trees and coastline of Humboldt and Del Norte counties. Since 1994, the National Park Service has partnered with California State Parks to cooperatively manage three state parks and Redwood National Park as a single entity for the benefit of all. For more information about the June 26th Centennial Celebration in the Redwoods, please contact Jeff Denny at 707-465-7760 or by email at jeff_denny@nps.gov. We are happy to arrange interviews for local media between now and the June 26th event, and assist you at the event itself. For other ways to enjoy your area parks, call the Redwood National and State Parks information office at (707) 465-7335. Park information is also available on the Redwood National and State Parks website at: www.nps.gov/redw . You can also find us as “RedwoodNPS” on Facebook, Twitter and Instagram.